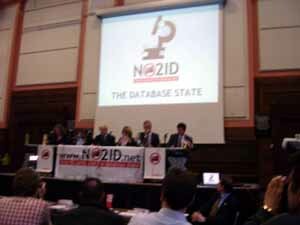 NO2ID Database State Mayoral hustings - where was Livingstone ? The NO2ID Campaign organised Mayoral hustings meeting yesterday 8th April 2008 at the Friends Meeting House opposite Euston Station was interesting. Jenny Jones (Green - deputising for Siân Berry), Lyndsey German (Left List / Respect), Boris Johnson (Conservative) NO2ID moderator Christina Zaba - brian Paddick (Liberal Democrat), Gerard Batten (UK Independence Party). The arrogant authoritarian incumbent Labour candidate Ken Livingstone, refused to turn up to this hustings meeting. Neither did he send a deputy, nor did he or his spin doctors dare to send any Answers to the 4 Questions which NO2ID had sent to each of th invited Candidates beforehand. 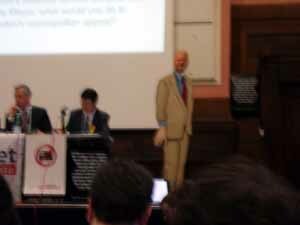 His malign "database state" influence was represented by a Cardboard Cut Out Ken, to much amusement from the audience. Boris Johnson said that this absence confirmed Ken's identity as a chicken. Continue reading NO2ID Database State Mayoral hustings - where was Livingstone ?.